A letter written by the owners of the Titanic explaining how a heroic crew member from Grimsby did not survive its sinking has fetched £2,150 at auction. The letter, from White Star Line, dated 19 April 1912, was sent to the family of Sixth Officer James Paul Moody. It details how the 24-year-old took the call warning of the iceberg which sank the ship. He died after giving up his seat in one of the lifeboats. The 93-year-old document was sold on eBay by a seller in Gwynedd, Wales. The rare letter, which was addressed to a property in Folkestone, Kent, was sold after 15 bids were placed. It was discovered in a hardback book of Shakespeare's Hamlet which was bought at a jumble sale 30-years-ago. Despite being described as "slightly moth-eaten in places" and having ink showing through from other letters it had been stacked with, the item sold during a 10-day listing. Moody, who was born in Scarborough in 1887, was recruited to sail on board Titanic after working for the White Star Line for a year. The ship set sail from Southampton on 10 April, 1912. Four days later it sank 400 miles off Newfoundland, Canada. The ship's lookout, Frederick Fleet, radioed Moody when he spotted the iceberg seconds after the lookout's bell rang three times signalling danger. 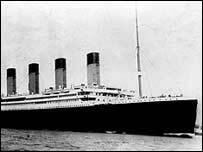 He relayed the information to First Officer William McMaster Murdoch using the words "Iceberg right ahead." After raising the alarm, he helped load the lifeboats and was seen trying to launch the collapsible vessels. The letter says Moody then told another officer to board lifeboat number 14 and that he would find one later. Unfortunately, he did not.